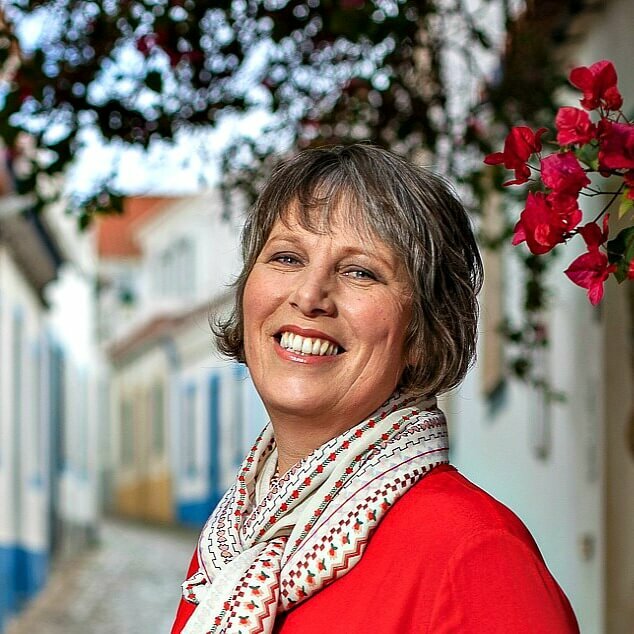 I’d been curious about Elvas ever since I picked up a brochure at Lisbon’s annual tourism show. After UNESCO granted it World Heritage status in 2012, I decided to see it for myself. My excuse to visit arrived in the form of an International Hot Air Balloon Festival hosted there so Mike and I spent the weekend exploring the historical town. 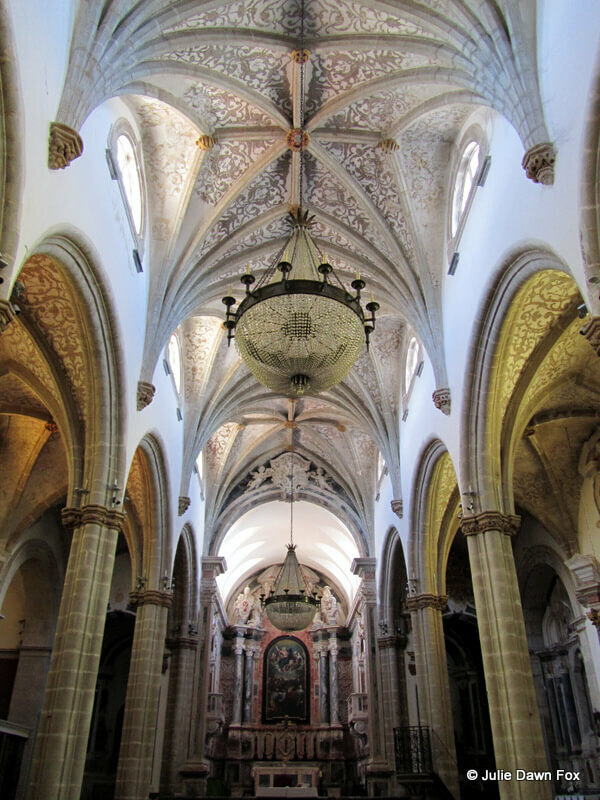 As we discovered, there are several things to do in Elvas. It’s usually closed on Sundays so we weren’t expecting to get inside the walls but walked towards the castle hoping to check out the views over the Alentejo plains. As we got closer, the sound of party music lured us to the main door, which was open. Inside, some men were sorting out crates of meat and sausages and setting up a mega barbecue. It turns out that the local mountain biking club were due for a celebratory meal after a hard day’s cycling. Although we weren’t invited to stay for the party, we did get to walk around the castle walls for some magnificent views without having to pay the usual €2 entrance fee. Normally, it’s open from Monday to Saturday from 9:30 to 13:30 then 14:30 to 17:30. 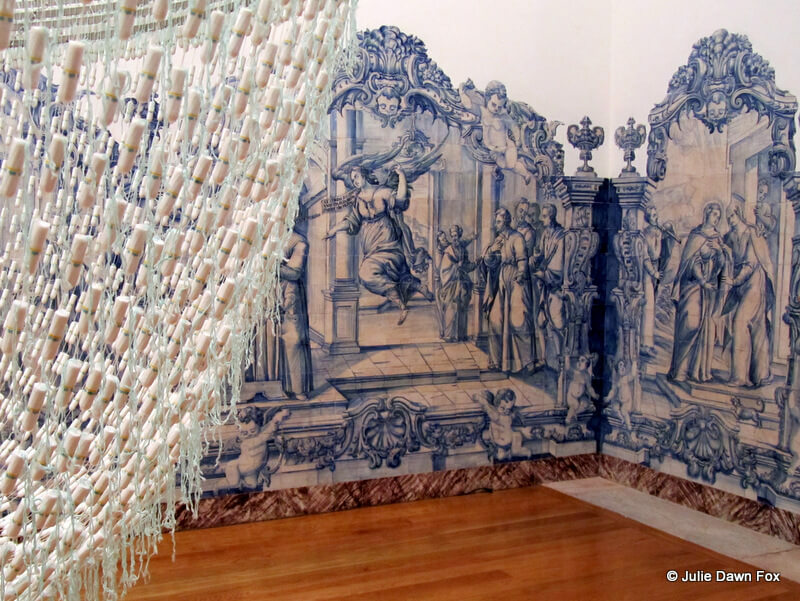 Another open doorway under the domed part of the castle led us to the ceramic workshop of Luís Pedras. 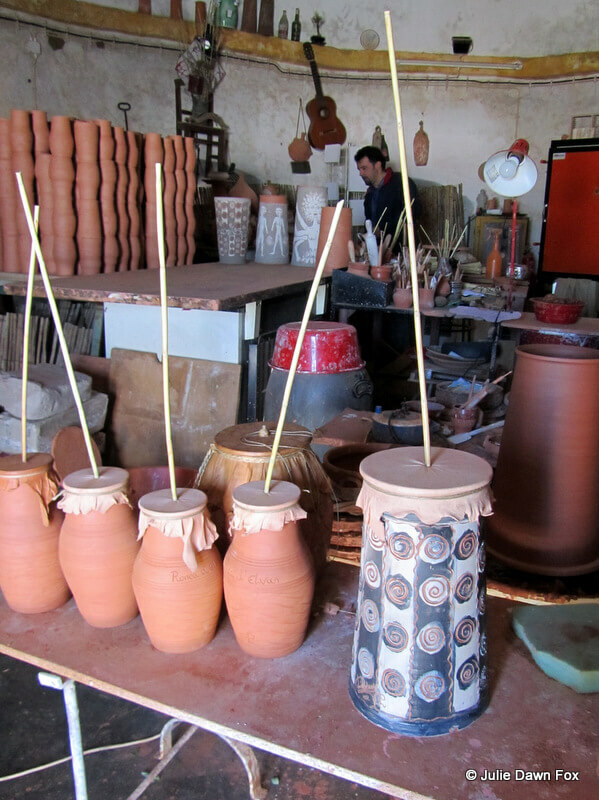 He was busy making the prizes for the balloon festival but took time out to show us his collection of roncas – ceramic tubes covered at one end with a skin. If you want to buy one to take home and play with, he has a selection of roncas and other ceramics for sale at his shop opposite the workshop. 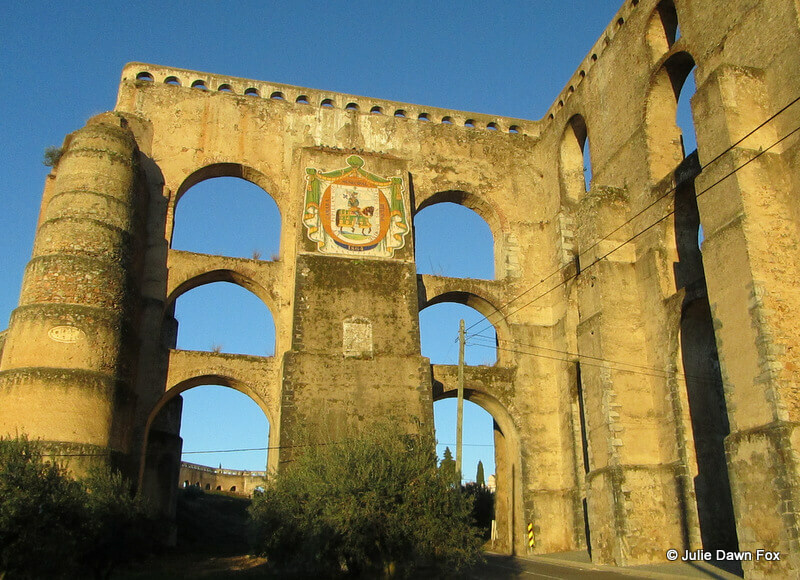 You can’t really miss the aqueduct if you arrive from the Lisbon end of Elvas, but even if you start off at a different entry point, it won’t take you long to walk around the walled city to find it. Its layers of open arches and thick stone walls stretch for 7 kilometres and took almost 100 years to build back in the 16th and 17th centuries. It looks its most impressive in the golden glow of early morning or late afternoon sun, and at night, it’s well-lit with dramatic effect. 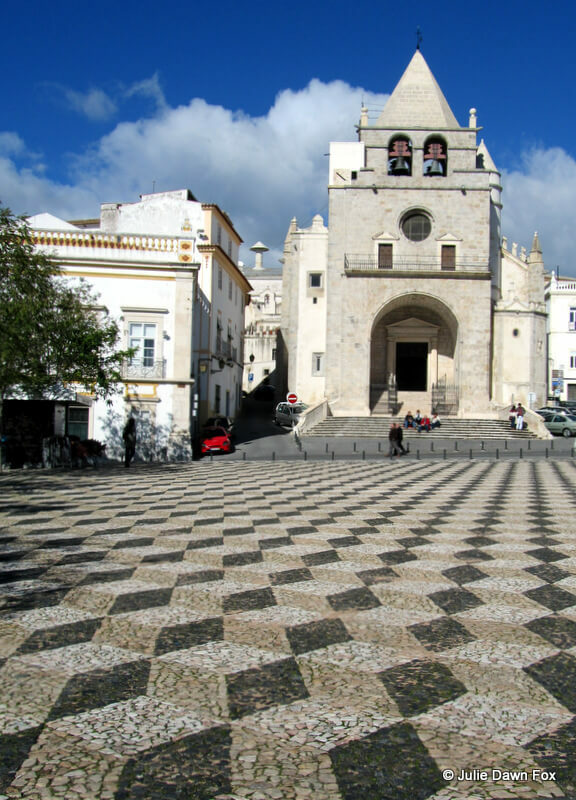 The multicoloured diamond patterned cobbles of the Praça da Republica set off the pale, angular features of the church with its short fat steeple and wide arched entrance. If you stare at the cobbles for long enough, you get a 3D effect. When we visited, late one Sunday morning, a group of people with something to celebrate were sitting on the steps of the church, sipping from champagne flutes. I’m not mad about visiting churches; I’ve seen enough ugly cherubs and gaudy alters to last me a lifetime but since the doors were open and we had nothing in particular to do, I stepped inside. I’m glad I did. The windows in the high vaulted ceiling allowed light to flood in, making the delicate patterns of the ceiling stand out and giving the stone pillars a yellowish tinge to match the chandelier. The altar area was one of many examples I saw around the city of the various colours of marble, from almost black to swirly grey and dark to pale pink, being used together. Although not something I’d like to recreate at home, it made a refreshing change from over-the-top gilt woodwork, which is apparently what awaits visitors to the church of the secular Franciscan order. Housed in a restored former hospital building in the centre of the old town, Elvas’ contemporary art museum has plenty to offer. As is always the case, some of the exhibits did nothing for me but there were some truly unforgettable pieces, one of them being the tampon chandelier. 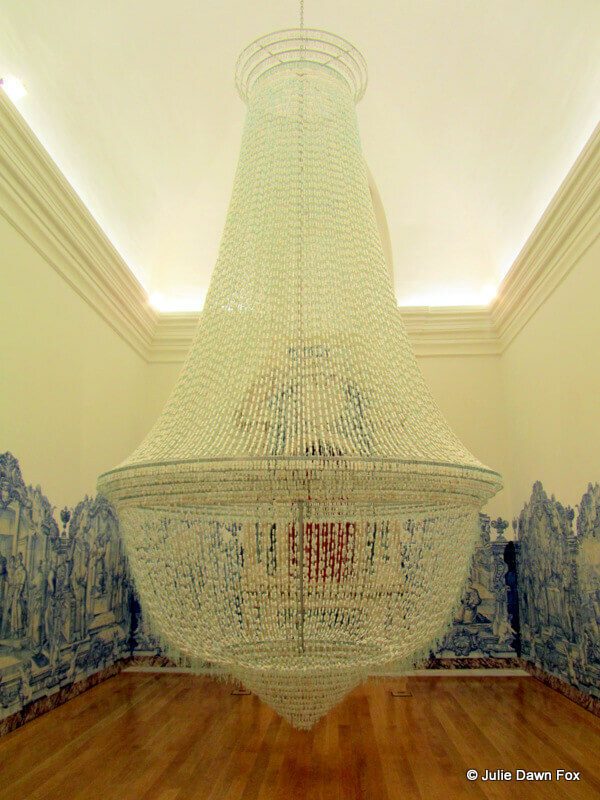 An oddity in itself, it’s displayed in a room where the walls are lined with original blue and white azulejos (painted tiles) which depict the life story of Saint Isabel and amplify the bizarreness of the chandelier. Mike thought he’d stepped into heaven when we found a small room containing step ladders, boxes of charcoals, pastels and coloured pencils and an invitation to “draw your thoughts”. 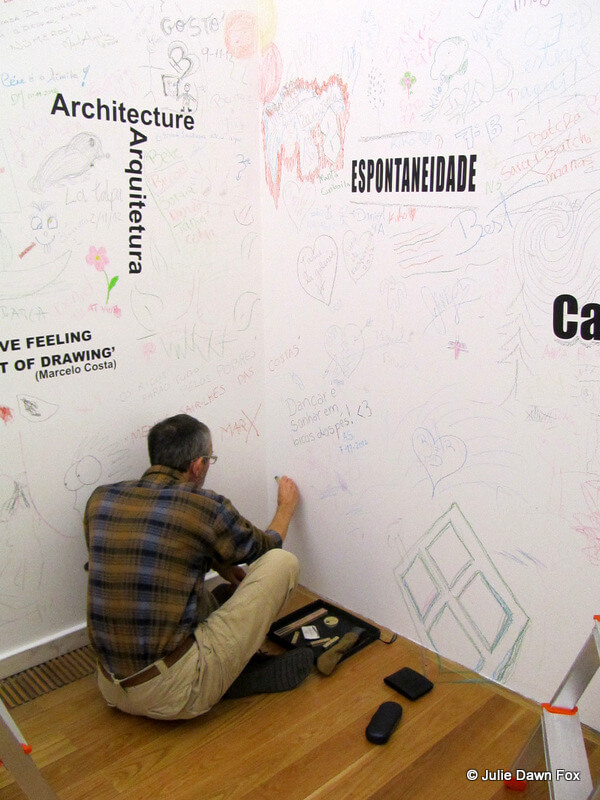 Without hesitation, he settled into a corner with the charcoals and started drawing on the wall. Once he’d finished his masterpiece, one of the stewards took us up to the 5th floor to the café where, as promised, there were impressive views over the white houses and narrow streets of the old city. 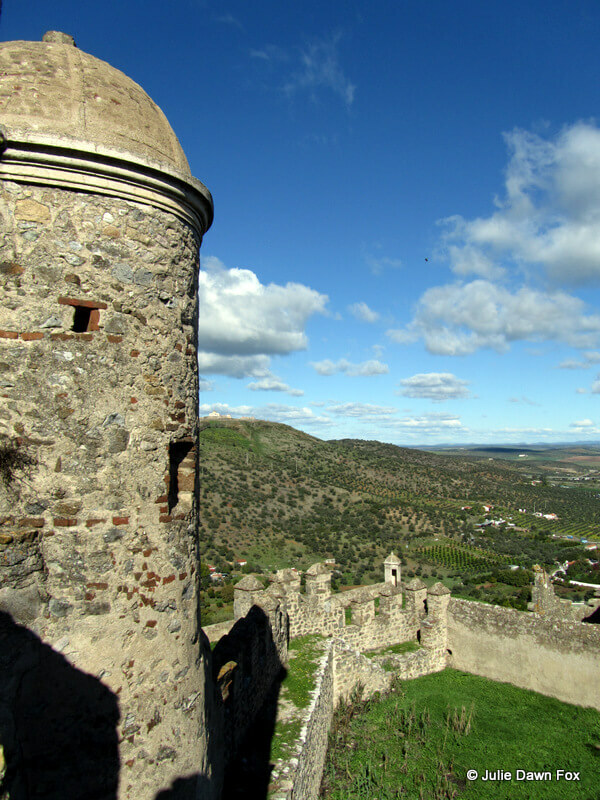 Being spitting distance from the Spanish border, and strategically placed between Lisbon and Madrid, Elvas had to be adept at defending itself in order to survive. The first defence wall was built in Islamic times, during the 9th century, and now provides an attractive setting for the old stone pillory, to which villains were once tied. 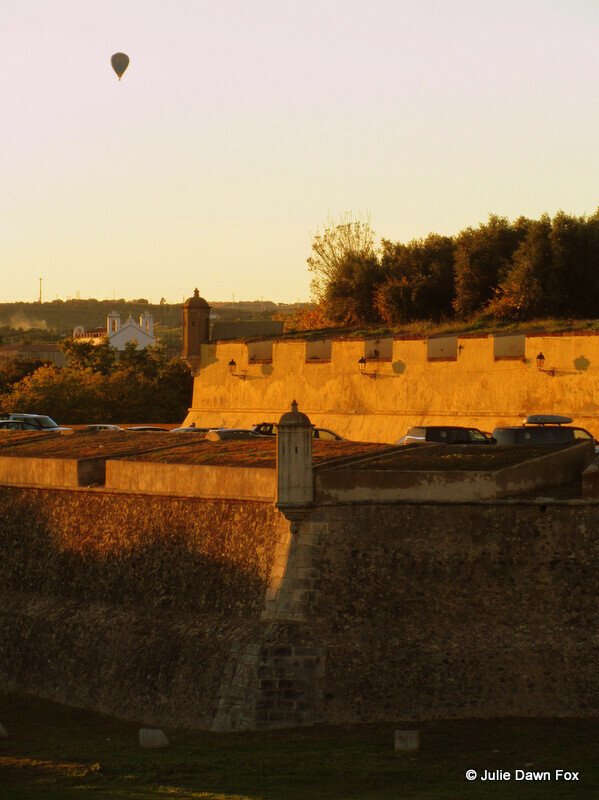 Over the years, bigger and better walls were built to surround and protect the city, the most recent being the bulwarked fortifications that enclose the historic centre, which were built in the 17th century. 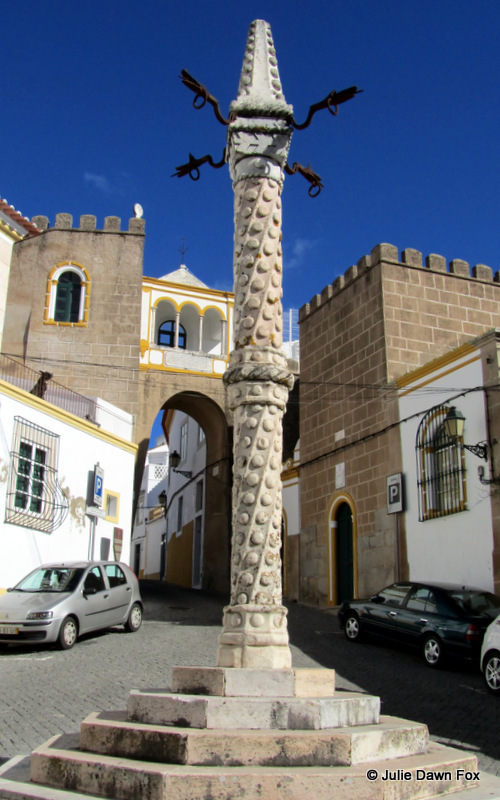 For more Elvas history and detail, check out the UNESCO website. 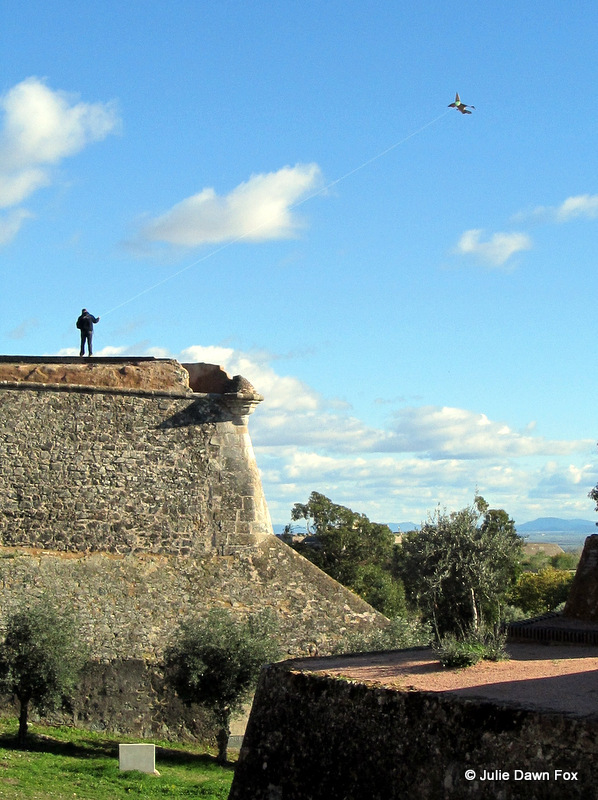 While you can’t walk a complete circuit around the walls, you can explore the gates, which come in a variety of styles, or find a high spot to fly a kite! Mike and I aren’t interested enough in military history to make the short trip to either of the neighbouring hilltop fortresses but one of them, Saint Luzia Fort, houses a military museum for those who care more than we do about guns and battles. Aside from eating and drinking and chasing hot air balloons, we didn’t have time for much more, except to roam the decaying streets marvelling at tiny doorways and strange shops. Mike’s only 5′ 10″ on a good day! The tourist information centre on Praça da Republica has maps of Elvas and various leaflets about its churches and museums but is absolutely useless if you’re looking for things to do outside the city. Thanks for the tips , Julie. 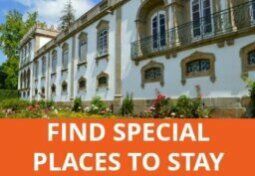 We will be staying at Elvas next Sunday night. The last stop on our tour of Western Spain before heading to our home in Portugal. My husband stayed at the Pousada over 25 years ago so it will interesting for him to see if it has changed much. I hope you had/have a lovely time, Pam. great information here. we’ll be passing through elvas in May. I have a question which I can’t seem to get answered anywhere. You may not be the right person to ask but thought i’d try anyway. 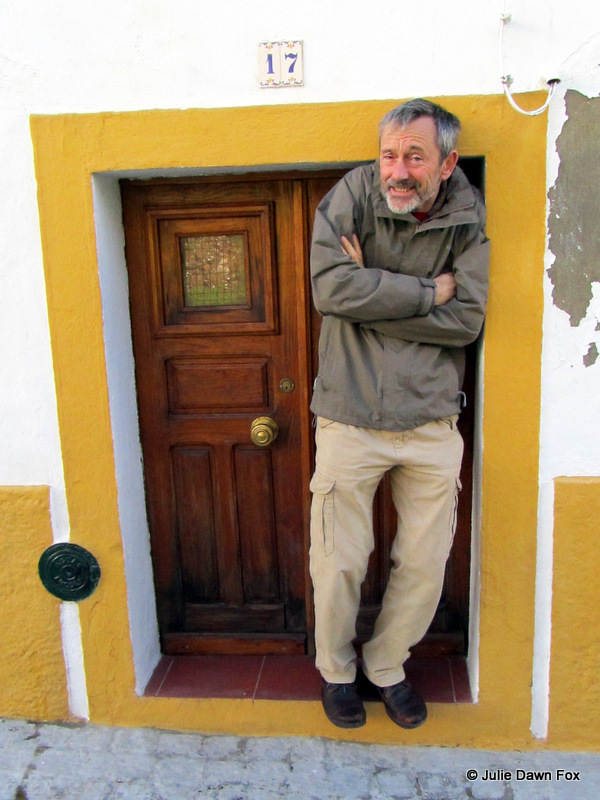 Can we get a taxi from elvas across the border to Badajoz? Hi there, Thanks for getting in touch. yes, it’s possible and will cost around 22 euros, depending on where exactly you’re going and what time / day of the week (metered taxis). You can ring Monteiro (Taxi driver) directly on 966150563 but he doesn’t speak English. Alternatively, here are a couple of other taxi numbers in Elvas who should be able to help: Taxis Antral de Elvas 268 622 287 or Adelino Rebelo Santos 268 623 851. 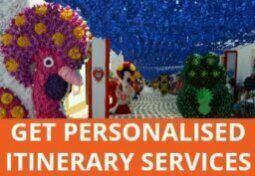 Or arrange it through your hotel. Have fun! That’s great, thanks so much for your help. Saved me a huge headache! Looks like a place with great variety in things to do. Should I put it on my list for my trip to Portugal next summer? I wonder who lives behind that door? There are other places I’d add to the list before Elvas so it really depends on how much time you’ve got, where you’ll be based and what you’re interested in. I don’t think it merits going out of your way for but it’s fine for a day trip if you’re in the area. Hope that helps. That’s good to know! 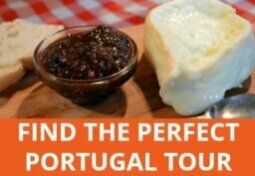 I only really want to put the best of Portugal on my list. I hope to take 5 weeks, but I want to spend about 12 days in each of Spain, Portugal and Morocco. I may have to drop Morocco if that is too much to squeeze in! I’ll be watching your blog for further ideas! The museum looks fun, Julie. Love that chandelier. I rather liked Nossa Senora dos Aflitos, but each to his own. 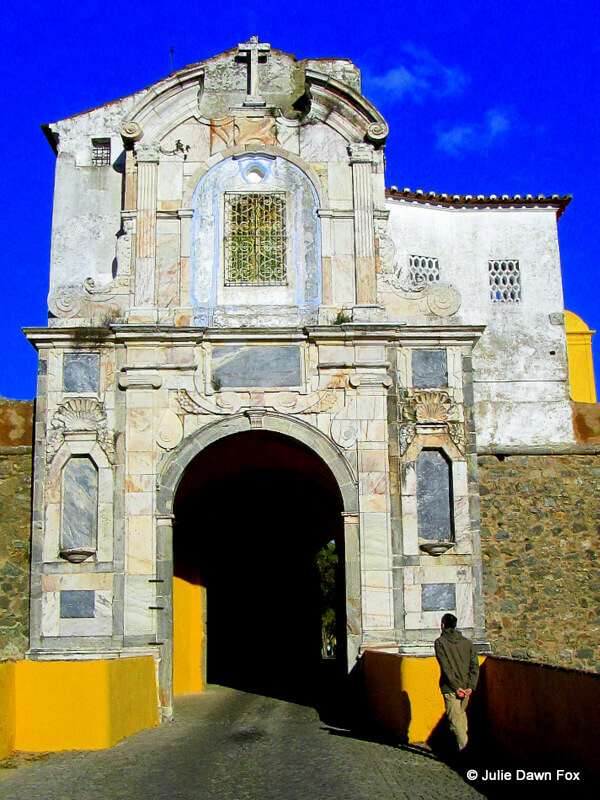 We were only there for a morning, en route to Vila Vicosa and Monsaraz. It was a November day of sunshine and showers and I believe we fled the rain. Hi Jo, I never made it to that church but the photos I’ve seen of it suggest that it’s quite cute. How was Vila Viçosa? I almost included it in our itinerary but we were a bit pushed for time so decided against it. I liked it. Again, not a lot of time but pleasant to stroll around.